Casual outdoor seating offers and inviting aesthetic that enhances the overall customer experience. 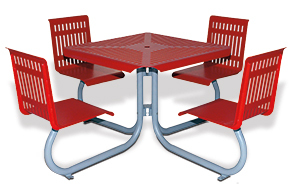 The four seat table is great for outdoor patios, cafés, driving ranges, coffee shops and courtyards. Constructed entirely from steel, this square café table is ready for outdoor use with an all-weather finish that is available in a popular selection of color options. The powder-coating finish is UV fade resistant and counters the conditions for corrosion. The table features a place to insert an umbrella without needing a base. Optional surface mount kits are available.